'New Vision' (Richard Tasco, R. 2012) Seedling 07-AB-50-33. AB (OGB), 34" (86 cm). Midseason bloom. Standards amethyst violet (RHS 81C), heavily veined darker, creamy white base and bottom edges, slight amber flush at midrib bottom; style arms orange buff (20C), indian pink (179B) on midrib and crest, veined darker; Falls raspberry rose (186A) blends out to pinkish-tan at edges, veined darker; beards based yellow, hairs tipped burnt orange in throat and middle, rusty henna at ends; large round dark plush burgundy black signal. 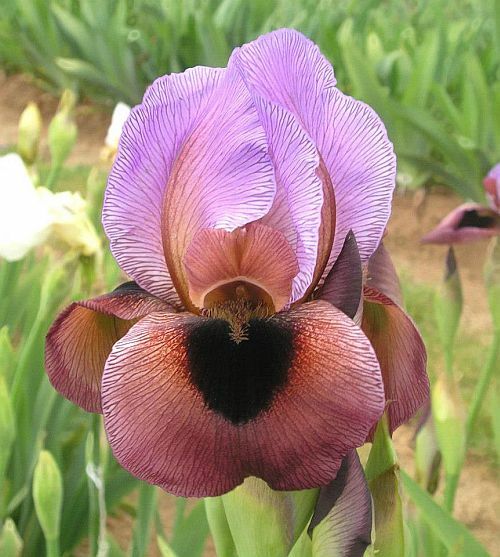 'Aztec Prince' X 04-AB-03-09: ('Bagdad's Folly' x 'Energizer'). Superstition 2012.